Pete begins by talking about reading for wisdom and not simply for information – suggesting we re-learn how to read - then shares a list of key books he has read in last six to twelve months. Jesus’ challenge to the leaders in his day, found in his sermon in Matthew 23, is so biting and sharp that some interpreters have wondered if these words are authentically Jesus’. They are. In this podcast, Pete breaks down Jesus’ challenge into 5 categories and shares how it applies to us today. To download a free e-book on Six Marks of a Church Culture that Deeply Changes Lives visit www.emotionallyhealthy.org/churchculture. Pete invites you into his personal journey of slowly breaking patterns and behaviors of overfunctioning. After considering the examples of Moses and Martha as classic overfunctioners, he lays out the three steps he took to stop overfunctioning. When we cross the line into “fixing” our ministries instead of leading them forward to greener pastures, we are overfunctioning. Pete invites you to listen to Geri’s reading of the audio version of an outstanding chapter out of The Emotionally Healthy Woman called “Quit Overfunctioning.” By the time you finish, it will make sense why quitting overfunctioning is foundational to leadership. 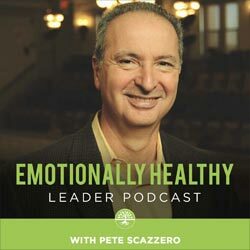 In part 2 of this podcast series, Pete explores four additional goals we frequently overlook in our leadership. To download a free e-book on Six Marks of a Church Culture that Deeply Changes Lives visit www.emotionallyhealthy.org/churchculture. Setting priorities as a Christian leader is one of our most challenging and difficult tasks. If we get it right, fruitfulness and joy follow. If we get it wrong, feelings of failure and misery follow. This podcast (Part 1 of 2) will consider, in detail, the most frequently overlooked priority and goal of our leadership.